This work started in 1967-68 and was completed in 1972. The slow progress and the many obstacles on the way is described in my Autobiography. The two problems - the Basis problem and the Approximation problem - had been open for more than 40 years, and many mathematicians had tried to solve them. I learned about them as a student. They were the big problems in Functional Analysis, that everybody wanted to solve. AMS had its 75 year celebration in 1991 and for that Professor P.Halmos wrote a report on "the progress of mathematics in the last 75 years". He reported on 22 mathematical discoveries and my solution of the Basis problem was one of them. And on IBM:s big poster over the History of Mathematics over the last 1000 years, the solution of the Basis problem is one of the less than 50 discoveries from the last century that is mentioned. In 1936 Professor S.Mazur promised a live goose for the solution of a problem, that turned out to be equivalent to the Approximation problem. 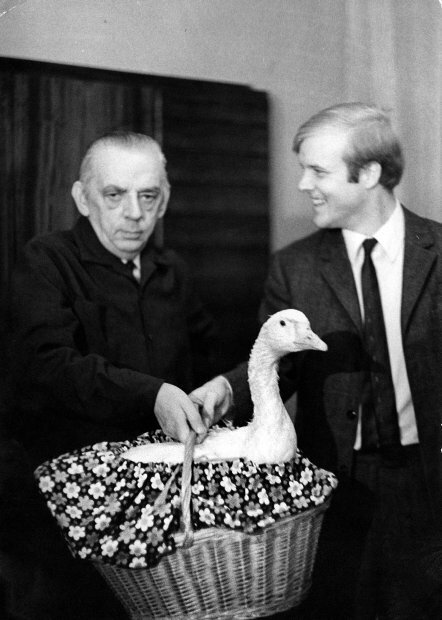 I received the goose at a ceremony in Warsaw, in December 1972. This work started in 1970 and was completed with a first manuscript in 1975. In Professor K.Saxe's book Beginning Functional Analysis, this work is referred to as "arguably his most famous contribution, so far". In a comment on 1 and 2, Professor L. Gårding talks about my "formidable ability to find new ways ...". ■ (Unpublished) L1 and l1 are not uniformly homeomorphic. The proof of this result uses that the set of metrical midpoints between two points is much larger in L1 than in l1. This midpoint argument has later been used and taken much further by other researchers. This work was done in the years 1964-70. It is a study of an infinite-dimensional version of Hilbert's fifth problem for topological groups - together with a study on uniform homeomorphisms between Banach spaces. Notions of non-linear type were introduced. They turned out to be useful also in other areas of Mathematics and in Computer Science. In 1946 I.Segal showed that groups modeled on Euclidean Space with x→xy differentiable for fixed y, are Lie groups. It was at that time the strongest result on Hilbert's fifth problem, in the sense that it was the weakest assumption on the group operations to get a Lie group. By a very different method I showed that this result generalizes to local groups modeled on Banach Spaces, if one assumes local uniform continuity of (x,y)→xy. This assumption is trivially satisfied in the finite-dimensional case and it cannot be removed in the infinite-dimensional case. If one removes differentiability conditions on the group operations and replaces them with weaker conditions - Lipschitz or Hölder or just uniform continuity - one is led to non-linear geometric problems in Banach Spaces. In the 1960:s, there was no theory developed in this direction and so I started by considering commutative groups modeled on Banach Spaces. And until today, there is no theory of non-commutative groups modeled on Banach Spaces, without differentiability assumptions on the group operations. For a commutative group modeled (locally) on a Banach Space, Hilbert's fifth problem would ask if the group is (locally) isomorphic to the additive group of the Banach Space. A first step in proving that is to establish a linear structure in the group. And a first step in establishing a linear structure is to solve the equation y = x2 in the group. I managed to do that under some Hölder condition on the group operation, by developing a notion of non-linear type in Banach Spaces. And, somewhat later, I had to develop a stronger non-linear notion to solve an embedding problem of Smirnov. Both these notions have turned out to be useful also in other areas of Mathematics and in Computer Science. Once one has estabished that a commutative group modeled on a Banach Space is in itself a linear space, one has to decide whether this linear space is isomorphic to the Banach Space it is modeled on. I managed to show that, under a local Lipschitz condition on the group operations, and if the group is modeled on a reflexive Banach Space and if locally x2 =0 implies x=0, then the group is locally the additive group of some Banach Space (0 is assumed to be the unit element of the group). And so, one is finally led to the problem: If a Banach Space is Lipschitz equivalent to a reflexive Banach, is it linearly isomorphic to that Banach Space? This problem is still open. In 1969 I managed to prove: If a Banach Space is uniformly homeomorphic to a Hilbert Space, it is linearly isomorphic to the Hilbert Space (and the conclusion holds also if they are just locally Lipschitz equivalent). At that time, it was the first result of that type. Since then, much research has been done in that direction. An infinite-dimensional version of Hilbert's fifth problem can be seen as a particular case of a very general question : To what extent do topological notions and results in finite dimensions carry over to Lipschitz (or Hölder or uniform continuity) notions and results in infinite dimensions? This work was done in September 1971. The main result is that the notions uniformly convex, uniformly smooth, uniformly non-square and super-reflexive are all isomorphically equivalent. The problem whether uniformly convex and uniformly smooth are isomorphically equivalent had been posed 30 years earlier, in 1941, by M.Day. Since the concepts uniformly convex and uniformly smooth had become increasingly important in Functional Analysis, it had become increasingly important to know whether they are isomorphically equivalent. Before me, R.C.James had solved half the problem. I learned about his result, soon after arriving in Berkeley in the end of August 1971. I felt that I had a chance to solve the other half of the problem - with the general strategies that I had developed in my isolation in Sweden. For me it was an unusually short time to spend on a problem - less than a month. ■ (A comment) Far-reaching improvements of the original approach by W. Davis and me have given, so far, the best results on the Banach-Mazur distance between finite-dimensional spaces with symmetric or good unconditional basis. By a mistake (neither mine nor Davis') my work with Davis appeared under just his name. N.Tomczak-Jaegermann, who did major work on these problems, has referred to our approach as the Davis-Enflo method. These are results in the linear isomorphic theory of Banach spaces (mostly from the period 1970-76). Some samples: Lp spaces are primary - i.e. if Lp a direct sum of two spaces, one of the spaces has to be Lp already. If Y and X/Y are Hilbert spaces then X is "almost" Hilbert space - but not necessarily isomorphic to Hilbert space. My insights from the years 1964-69 were used in these papers. These results are mostly from the late 80:s and early 90:s. The concept "minimal point" is an outgrowth of my efforts in 1 and it turned out to be a special case of the concept Pareto optimal point in Economics. It also turned out to be a fruitful concept in several areas of non-linear theory in Banach Spaces. The first paper contains Fixed point results for contractive maps and an Approximation result for Pareto optimal points in Economics. The other papers contain characterizations of contractive subsets of lp-spaces (with Davis) and - much harder - the same characterizations in Lp-spaces (by myself). Because of the connection to Approximation theory, one can find special cases of these results as results in Approximation theory. The problem whether "optimal" and "contractive" are equivalent for uniformly convex spaces is still open. This work started in the 1970:s but most of it is from the 1980:s and 1990:s. The three first papers contain results on products of polynomials in many variables and on "polynomials with concentration at low degrees". These concepts and results grew out of my work on the invariant subspace problem, because they were needed there. They have connections to Number Theory, so two of the papers were published in Journal of Number Theory. The idea that there are product results for polynomials which are independent of the number of variables was a surprise to many (including, initially, myself). The general direction to find results for polynomials which are independent of the number of variables has been fruitful and the fourth paper (in J. of Approximation theory) contains such results. I worked for many years, trying to find better methods to estimate Weyl sums (to me, this seems to be an even more important problem for the future than the much more famous Riemann Hypothesis). The first paper contains most of my efforts, which were never successful. I still have a feeling that the approach could work, if one can just do it right. The paper has almost no results but lots of open questions. It was reviewed by Professor Heath-Brown in Math.Reviews. He said that he understood rather little of the paper, but had been struck by one of the results, which generalized earlier known results. But that result was just a "dead end" application of some known methods, so from my point of view it ought to have been the least interesting part of the paper. The second paper is an outgrowth of some ideas in the first paper. It turned out that they can be used to obtain stability results for certain linear operators. I discovered in the mid 1990:s a connection between different types of extremal vectors and invariant subspaces. Examples of such extremal vectors are i.e. best approximate inverses of non-invertible operators. This gave, in particular, a new, short and more constructive proof of Lomonosov's famous result that operators commuting with compact operators have invariant subspaces. The method has been used by several researchers to obtain new results on invariant subspaces. It gives invariant subspaces for large classes of operators. How far it goes is still open. The Scottish Café was the café in Lwów now Lviv where, in the 1930s and 1940s, Polish mathematicians from the Lwów School of Mathematics met and spent their afternoons discussing mathematical problems. The café building now houses the Universalny Bank at 27, Taras Shevchenko Prospekt. Stanislaw Ulam recounts that the tables of the café had marble tops, so they could write in pencil, directly on the table, during their discussions. To keep the results from being lost, and after becoming annoyed with their writing directly on the table tops, Stefan Banach's wife provided the mathematicians with a large notebook, which was used for writing the problems and answers and eventually became known as the "Scottish Book". The book - a collection of solved, unsolved, and even probably unsolvable problems - could be borrowed by any of the guests of the café. Solving any of the problems was rewarded with prizes, with the most difficult and challenging problems having expensive prizes during the Great Depression and on the eve of World War II, such as a bottle of fine brandy. For problem 153, which was later recognized as being closely related to Stefan Banach's "basis problem", Stanislaw Mazur offered the prize of a live goose. This problem was solved only in 1972 by Per Enflo, who was presented with the live goose in a ceremony that was broadcast throughout Poland. When I was eight years old, my elder brother Bengt started to give me math problems, which were different from anything I had seen before, and where there was no indication how they should be solved. For me this was a very important influence. In my mathematical career I have always preferred to work on problems, where the known methods had failed and where one needed to come up with new ideas and methods to solve them. Other important early influences were my teachers in piano and composition. When I started to do research in mathematics I went about it in the same way as if I should compose a piece of music. I had the idea that I should create my own piece of art. So I made up some systems of equations involving addition and composition of functions, and started to solve them. I showed professor Rådström at Stockholm University what I had done. He suggested that I should study topological groups, which might provide some framework for what I was trying to do. I read the books by Pontrjagin and Montgomery-Zippin on topological groups and that led me to work on an infinite-dimensional version of Hilbert's fifth problem. For 5 years, 1964-69, I worked in isolation on this project. In this process I developed new insights and methods, which turned out to be useful for solving long-standing, fundamental and famous problems in Functional Analysis. "Per Enflo was born on May 20, 1944, in Stockholm, Sweden. His father was a surveyor, his mother an actress. Per Enflo is one of five children born to his parents. His family has been, and is, very active in music and other performing arts, and this involvement has been a strong influence in his life. During his school years, the family moved to various places in Sweden, but Enflo enjoyed a stable, happy home life and good schooling. Around the age of eight he became interested in both mathematics and music. These are the two subjects that he was prodigious in and to which he remains most devoted. You are reading about him because of his mathematics, but in fact, Enflo is almost equally a musician and a mathematician. In music, Enflo has studied piano, composition, and conducting. His first recital was given at age eleven. Though devoted to both mathematics and music, it is the former that has determined where Enflo has lived. All of his academic degrees have been awarded by the University of Stockholm. Since completing his education in 1970, Enflo has held positions at the University of Stockholm, the University of California at Berkeley, Stanford University, the ´Ecole Polytechnique in Paris, the Mittag-Leffler Institute and Royal Institute of Technology in Stockholm, and at the Ohio State University. Since 1989 he has held the prestigious position of “University Professor” at Kent State University. Per Enflo’s solution to the approximation problem also gives a counterexample to the basis problem. This work was started in 1967 and completed in 1972 and is a long story of progress and failures and of slowly developing new insights and techniques for final success. Arguably, his most famous mathematical contribution thus far is his solution to the invariant subspace problem. He constructed a Banach space X and a bounded linear operator T : X -> X with no non-trivial invariant subspaces. The paper containing this example was published in 1987, but it had existed in manuscript form for about twelve years prior to that date. The published paper is 100 pages long, and contains very difficult mathematics. His work on the invariant subspace problem was accomplished during the years 1970–1975, so one can see that the late 1960s to the mid 1970s was a period of remarkable brilliance for Enflo. Enflo’s counterexample, though it gives a complete solution to the invariant subspace problem, left open many doors for future research. For example, determining classes of operators that must have invariant subspaces (in the spirit of Lomonosov’s result) is an active area, and, equally, some of the mathematics developed in his solution to the invariant subspace problem have led him to progress in other areas of operator theory. The mathematical work discussed in the last few paragraphs might seem particularly abstract, but parts of the associated work have genuine applications. For example, some of the best available software algorithms for polynomial factorizations are based on ideas found in Enflo’s solution to the invariant subspace problem. Also, there are indications that his Banach space work might have good applications to economics. Enflo’s other important mathematical contributions include several results on general Banach space theory, and also his work on an infinite-dimensional version of Hilbert’s 5th problem. Per Enflo has solved fundamental problems in functional analysis. the invariant subspace problem for Banach spaces. In solving these problems, Enflo developed new techniques which were then used by other researchers in functional analysis and operator theory for years. Some of Enflo's research has been important also in other mathematical fields, such as number theory, and in computer science, especially computer algebra and approximation algorithms. Enflo works at Kent State University, where he holds the title of University Professor. Enflo has earlier held positions at the University of California, Berkeley, Stanford University, École Polytechnique, Paris and The Royal Institute of Technology, Stockholm. Enflo is also a concert pianist. Other researchers have later worked on generalizing results for "polynomials of degree n" to "polynomials with some concentration up to degree n". ■ Exponential numbers of linear operators in normed spaces, (with V. Gurariy, V.I. Lomonosov, Yu.I. Lyubich), Linear Algebra and its Applications, 219, pp. 225-260 (1995). My indirect contributions through my students.